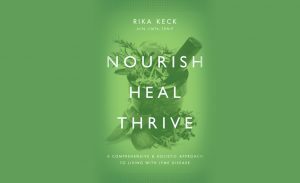 NOURISH, HEAL, THRIVE: A comprehensive and holistic approach to living with Lyme disease is now available in soft cover and Ebook. Buy your copy now and start to feel better! “My continuous studies opened my eyes to how I could support my clients from a personalized nutritional, holistic, and functional paradigm. All along, I was staying abreast of cutting-edge information regarding chronic Lyme, vec- tor-borne infections, biotoxins, and environmental medicine. In the meantime, I have been honored to collaborate with various medical professionals, including Lyme-literate medical doctors. Through the years, I have dealt with my own health challenges, including multiple skin cancer surgeries, physical injuries, and family illness. I was also faced with the devastating and very sudden loss of my mom in 2014. While supporting clients with chronic Lyme from a nutritional and clinical perspective (not treating the disease), I felt compelled to write this comprehen- sive book. It is not just about the illness; it is about the terrain. Many symptoms can be caused by vector-borne infections, yet our daily nutritional and lifestyle choices, plus environmental toxin exposures, can harm and provoke the body too. I have witnessed grateful clients who have more energy, can tolerate more foods, and have become more empowered through the process of learning how they can use food to help themselves heal. This has given renewed hope and joy to lives that were involved in an ongoing struggle for many years. If you suffer from debilitating Lyme disease after antibiotic treatment – or are in treatment right now- do buy a copy of NOURISH, HEAL, THRIVE: A comprehensive and holistic approach to living with Lyme disease. Now available on Amazon.com in soft cover or Ebook format. Contact me at #NourishHealThrive if you have a question.